Nijmegen based band The Hubschrauber (German for chopper) didn't want to make a full album yet, since they think an album should be more than just a collection of songs and should tell a story. So instead they chose to record their second EP I Want To Buy A Farm With You, which gives them an opportunity to practice their "album making skills". They even made a mini-documentary about the recording process. The band sounds mostly melancholic with playful guitars and warm vocals. They consider themselves a mix of the Pixies' dynamics and Grandaddy's melancholy, but when you listen to the tracks you'll also hear early dEUS which is not a bad reference either. This is not only because of the way the music and vocals sound, but also the way the songs build up and the band’s way of using dynamics. You can hear this on opening track 'Euphoria' that is alternating between slow, melancholic parts and rocking moments with a nice gritty guitar. The band is clearly influenced by the grungy sound of the nineties as well, which you can hear in 'Clarity' and 'Simple-Minded Lucky Man'. It definitely bears the sound that the Pixies started and which was used by so many alternative bands in that time and today. 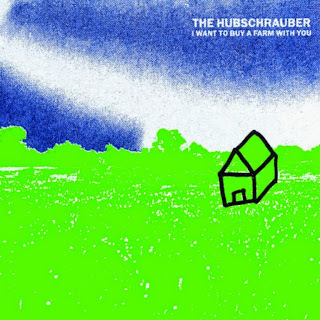 The Hubschrauber make it their own and are not simply copying it. Two interludes are mixed in between the tracks, where the first one, that sounds like a defective tape recorder, plays after track two. The second one later on is a piano part that sounds as if it was recorded ages ago. The album cover of I Want To Buy A Farm With You is a picture of a little house as a kid would draw it on a colourful background, but the record is definitely no child’s play. No, this is the real stuff, these are mature convincing songs with clever arrangements. Compositions that breath the right atmosphere and are of a high musical level. Although you can clearly hear their influences in the music, they know how to apply it to their sound in a tasteful way. Hopefully The Hubschrauber has a story to tell very soon, since it will be very interesting to hear a full album. Listen to 'I Want To Buy A Farm With You' on Spotify.